On this day in 1776, an angry mob, incited by a public reading of the Declaration of Independence, pulled down a statue of King George III in Bowling Green Park in New York City. Its lead was melted down and molded into musket balls. In the meantime, Encyclopedia Virginia contributor Ervin L. Jordan Jr. recently asked when, once we start, does the tearing down end. What about Confederate statues in cemeteries? Are we going to desecrate those gravesites by pulling those down? Well, as it happens … Memphis plans on moving the remains of Nathan Bedford Forrest from a park where there stands a big equestrian statue of the former slave trader, Confederate general, and KKK member—although perhaps, in this instance, it’s a win-win. It was a shameful period in our history. [I]s that still the narrative that we want to convey in the 21st century? What if we’re just seeing what we assume to have been there, rather than what is actually there? That’s always a danger with history. And I think that, in our often well-intentioned desire to acknowledge a racist and violent past, we risk losing, even erasing, an important part of our history. Back to the original question: What narrative do we—as a community, as a state, as a nation—want to convey? Not one, I hope, where we shy away from difficult truths. One of these is the way in which, in the decades after the Civil War, the idea of the Lost Cause took hold, north and south. By venerating men like Lee and the heroism of the common Confederate soldier, by deciding that slavery really had nothing to do with any of it and that, in the end, the Confederacy was only defeated by sheer, overwhelming numbers, white people in America moved past the hatreds that led to war. Of course, I’ll bet none of them were African American. Black folks were left out of this particular reconciliation, left to their own devices as they lost the vote in Virginia and sometimes their lives. Is this the narrative we want to convey? Well … yeah, assuming that we aren’t propagandists and don’t want to only tell the comforting, inspiring stories. And one way to make sure we remember this period in our history, and the often deadly and immoral compromises we as a nation made, would be to keep the monuments and better educate ourselves about what they meant and what they mean now. If we get rid of them, won’t it just be that much easier to forget? Civil war does not make anything better. 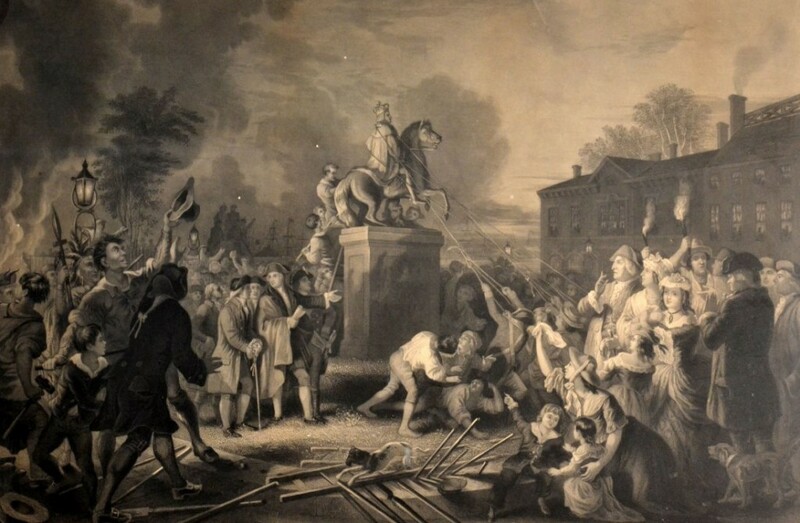 I think an angry mob pulling down the statue of George III, because emotions over reason. We are in the beginning of a new civil war because people aren’t being taught to control that chip on their shoulders.